As a kid, my favorite holiday cookies were among the sweetest. I always gravitated toward sugar cookies and peanut butter blossoms, which I still love. But, my tastes have definitely matured since then. I now find myself reaching for cookies that aren’t quite as sweet during the holidays. My favorites are those that let simple, high-quality ingredients shine. 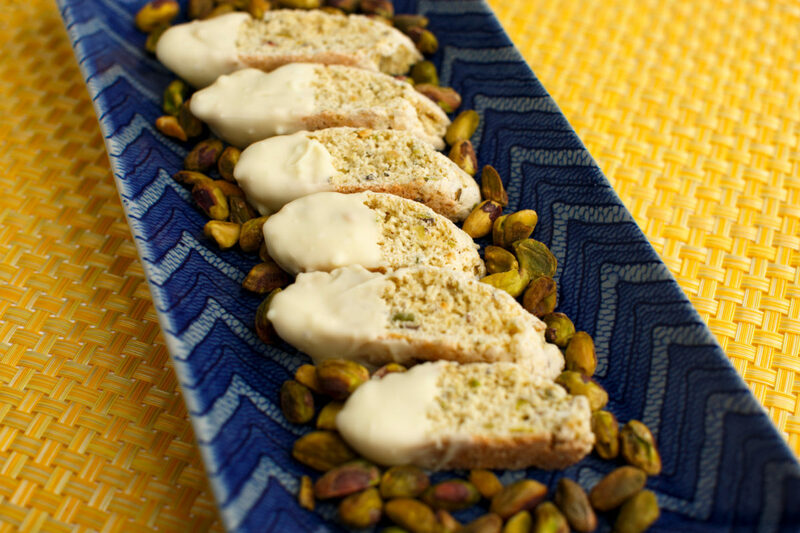 My mom started making this lemon pistachio biscotti when I was a kid. While it wasn’t my favorite cookie growing up, it definitely is as an adult. 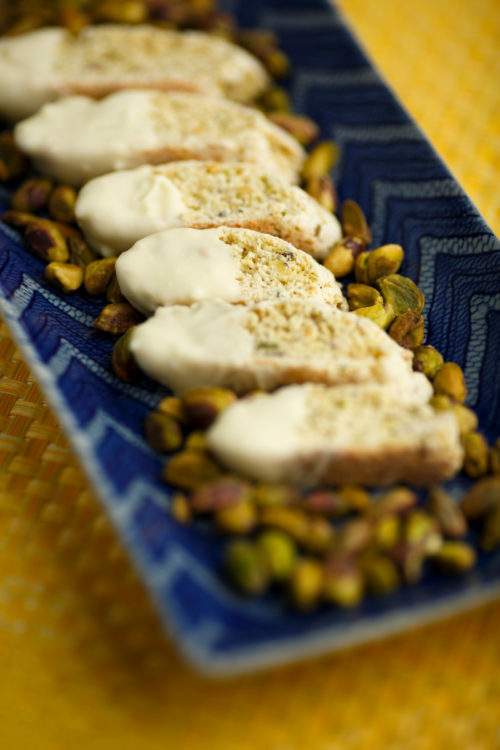 I’m a big fan of lemon in just about everything, and the addition of pistachios gives this biscotti a rich, nutty flavor. I like to dip the biscotti in white chocolate around the holidays, which makes for a beautiful presentation. Biscotti is also among the easiest types of cookies to make. It’s supposed to be dry, which makes it foolproof. The cookies are also pretty durable, which makes them great hostess or office gifts. I like to double this recipe, then throw half of the biscotti in the freezer to have on hand when we’re hosting guests. They’re great to pull out in the afternoon to enjoy with coffee. In a large bowl, whisk together flour, sugar, baking powder, baking soda, pepper and salt. Set aside. In a small bowl, whisk together eggs, lemon zest and lemon juice. Add lemon mixture and pistachios to the bowl of dry ingredients. Stir until combined and a stiff dough forms. Spread the powdered sugar on a clean work surface and place the dough on top. Divide the dough into four equal portions. Roll each piece into a log, about 1-inch in width. Place two logs each on cookie sheets lined with parchment paper, making sure the logs are at least two inches apart. Bake for 15 minutes, until the cookies feel firm. Place the cookie sheets on a cooling rack and lower the oven temperature to 300 degrees. Once the cookie logs are cool to the touch, use a serrated knife to cut the logs into 1/2-inch thick, diagonal slices. Place the biscotti back on the cookie sheets and bake for an additional 13-15 minutes, until slightly browned and dry. Place on a cooling rack to bring down to room temperature. While biscotti cools, place chocolate chips in a microwave-safe bowl and microwave on high for 30 seconds. Stir chocolate chips, then continue microwaving at 15-second increments until the chocolate is just melted. Dip each piece of biscotti in the white chocolate, so that half of each piece is covered.